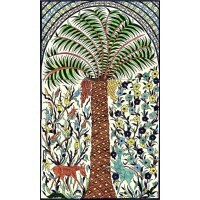 UNIQUE HAND PAINTED CERAMIC TILE DECORATIVE MURALS . These Decorative Tile Murals are both for internal and outdoor tile design projects. Beautiful bathroom tile projects can be achieved using unique murals in the shower area. Spectacular kitchen tile splash back designs are achieved using tile murals.